A membership with Thunderbird entitles you to free lodging and the use of the surrounding grounds. Enjoy the peaceful 50-acre grounds, with large oak trees, evening geese returning to their roosts “roof-top” high over the lodge, deer in the back pastures, migratory songbirds, noshing on copious volumes of food, and Friday night cocktails sitting on the front porch or gathering around the fire-pit with others sharing similar passions. The lodge is our operational hub and central gathering point for our members. The main lodge has all the comforts of home, sleeps 25 in five bedrooms, has a satellite TV, fully supplied kitchen, two bathrooms, two living rooms, one dining room, linens and towels, and the all important covered porch outside. 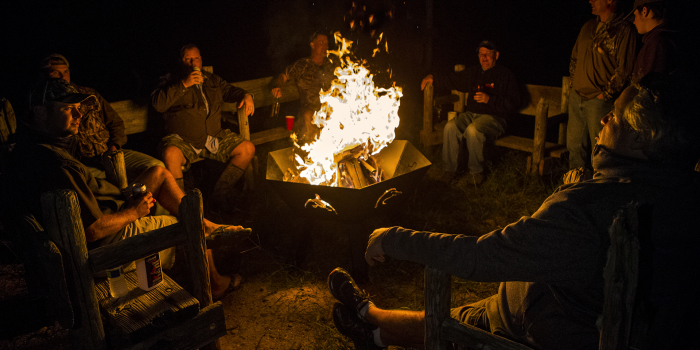 The headquarters has bird cleaning facilities, barbeques, workshop, washer/dryer, and the all important outdoor fire-pit for telling campfire stories. In addition the lodge grounds have RV pads, private cabins, private stalls for ATV’s, private storage lockers for equipment & ATV storage (all limited with additional fees). On many of the opening weekends the club hosts dinners that in the past have been Oyster-fests, Shrimp & Fish Fries, Crawfish & Crab boils, all with the fix’ns.